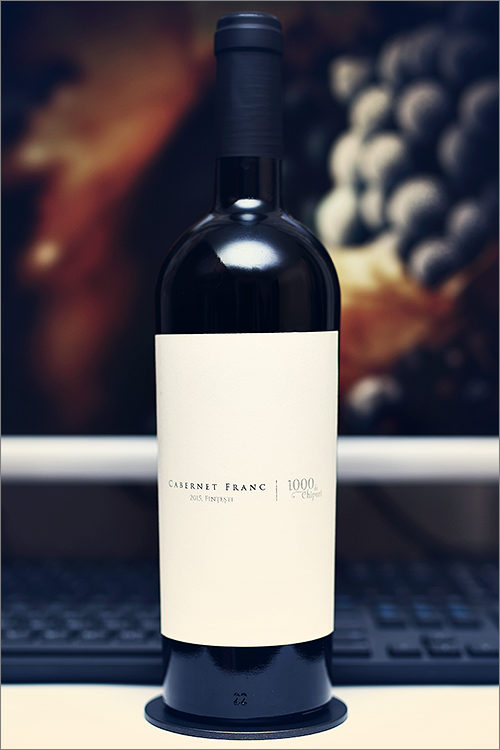 The wine we are going to review tonight is a single varietal cabernet franc wine from Romania – Cabernet Franc 2015 by 1000 de Chipuri. Cabernet Franc is the parent grape for Cabernet Sauvignon and Merlot varieties. The thing about cabernet franc that makes it unique is that it can’t hide its nature – it has always been a bit more peppery, savory and lean compared to its pedigree children. For this reason, most winemakers use it sparingly in blends. In a blend, cabernet franc transforms what might have been a boring fruit-bomb into something that makes us go: Wow! Magic!, but let’s get rid of the theory part. Without further ado, we move on, straight to the tasting! Deep and opaque garnet color, with elegant crimson hues towards the rim of the glass. The nose is strong, filled mostly with ripe black fruits and spicy flavours: overripe blackberry, blackcurrant, black raspberry, ripe sour cherry, sun dried wood, black cherry, ripe black plum, red bell pepper, paprika, roasted oakwood, ripe blueberry, smoked plum, black plum jam, cherry tree wood, black mulberry jam and nutmeg. An instant later the nose is filled with elegant notes of black pepper, anise, charred wood, black tea, tobacco and some nuanced hints of walnut jam. The wine is dry, with high alcohol level, high acidity and ripe tannin. It feels bold, seedy and tannic, with a quite firm and muscular accent. This is a very ripe, nuanced and extracted wine, as it tastes fruit-forward and a bit oaky. The wine feels quite tannic, expansive and a bit austere, with a good overall balance and a touch of alcoholic warmth showing through on the mouthfeel. It has a long finish and a balanced, seedy and quite fruity aftertaste. This is definitely a fine Wine of Romania and the overall rating says the same, with 91.7 points scored it is right there, among the best wines we’ve tasted so far. Please click on the chart icon on the left in order to get to the wine rating page, where you can find all the wines we’ve tasted to date. Conclusion: this is a fine cabernet franc wine on the rise – not yet in its prime form, therefore we would recommend at least 2 more years of bottle ageing, so that the wine will get enough time to round up. Despite its angularity, the wine has a very ripe tannic grip on the mouthfeel, that leads to an extracted fruity mid-palate, closing in beautifully with a bitter-seedy finish. In order to match this wine’s character, and it has plenty of it, we would recommend to pair it with spicy meaty dishes, like for example a spicy asian steak or a spicy t-bone steak. Just remember – the wine is the boss, thus make sure you tame the flavour of the dish, so that it will not take over the ripeness of the wine. Cheers!